The rise in energy prices is an unwelcome reality in today’s manufacturing environment. Energy cost reduction strategies are vital to staying competitive. Facility engineers are challenged to optimize energy efficiency and extract as much productivity out of every unit of energy paid for. Harnessing the heat from compressed air systems can greatly increase operational efficiencies and help reduce a plant’s carbon footprint. In fact, 100% of the electrical energy used by industrial air compressors is converted into heat. Up to 96% of this heat can be recovered and put to use, significantly lowering a facility’s energy costs. For example, a 50 hp compressor running 8000 hours per year with $36,000 in annual energy costs could save $6175 for natural gas and $24,300 for heating oil by utilizing heat recovery strategies. 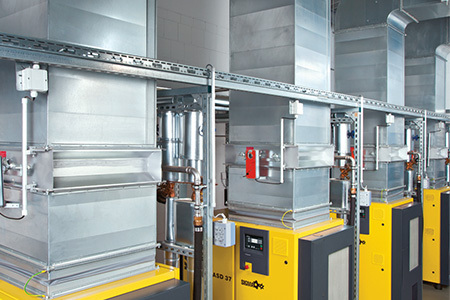 The heat generated by compressed air systems can be used for warm air applications as well as water and fluid heating. By integrating standard HVAC duct work and controls, warm air from compressors can be harnessed for many purposes. The warm air is captured by simply ducting the air from the compressor and feeding the warmed cooling air to where it is needed such as adjacent facilities, warehouses, plant floors or even the compressor room. By also installing thermostatically controlled louvers, you can precisely maintain the desired room temperature throughout the year. Compressors can also be connected directly to a continuous process heating application, giving year-round energy savings. All Kaeser rotary screw compressors have top exhaust and can easily be fitted with exhaust ducting. Kaeser’s AS compressors and larger are equipped with a radial fan with high residual thrust. For water and fluid heating applications, the key is obtaining a thermal match between the heat being recovered and the heat that is needed for the process. Kaeser can help engineer a customized solution to tap into these significant savings. Fluid-to-fluid heat exchanger systems can provide on-demand heating and service water heated to temperatures up to 160°F or even 195°F depending on requirement. This significantly reduces the energy required for purposes such as: boiler makeup water, heating process fluids, heating food and beverage products, and hot water for showers. In addition, Kaeser compressors are easily adapted for fluid heat exchangers. In fact, many models offer built-in fluid-to-fluid heat exchangers as an option to recover up to 76% of the original input energy. Beyond energy savings, an important argument can be made for the environmental benefits that heat recovery can bring. By implementing a heat recovery strategy, plants can help significantly reduce their carbon footprint. For an additional resource on how to use heat recovery in your plant, download our complimentary technical white paper here.